During the First Buddhist Council, Ananda recited the Sutta Pitaka, and Upali recited the Vinaya Pitaka thirty years after the parinibbana of Gautama Buddha in Rajgir. The Arhats present accepted the recitations and henceforth the teachings were preserved orally by the Sangha. The Tipitaka that was transmitted to Sri Lanka during the reign of King Asoka were initially preserved orally and were later written down during the Fourth Buddhist Council in 29 BCE, approximately 454 years after the death of Gautama Buddha. [a] Textual fragment of similar teachings have been found in the agama of other major Buddhist schools in India. They were however written down in various Prakrits other than Pali as well as Sanskrit. Some of those were later translated into Chinese (earliest dating to the late 4th century CE). The surviving Sri Lankan version is the most complete, but one that was extensively redacted about 1,000 years after Buddha's death, in the 5th or 6th century CE. 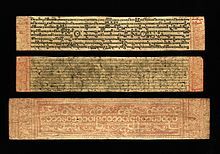 The earliest textual fragments of canonical Pali were found in the Pyu city-states in Burma dating only to the mid 5th to mid 6th century CE. The Vinaya Pitaka and the Sutta Pitaka are remarkably similar to the works of the early Buddhist schools, often termed Early Buddhist Texts. The Abhidhamma Pitaka, however, is a strictly Theravada collection and has little in common with the Abhidhamma works recognized by other Buddhist schools. In pre-modern times the Pali Canon was not published in book form, but written on thin slices of wood (Palm-leaf manuscript or Bamboo). The leaves are kept on top of each other by thin sticks and the scripture is covered in cloth and kept in a box. The Canon is traditionally described by the Theravada as the Word of the Buddha (buddhavacana), though this is not intended in a literal sense, since it includes teachings by disciples. 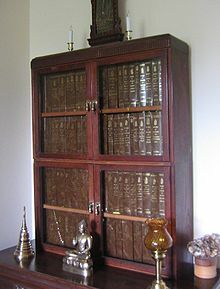 The traditional Theravādin (Mahavihārin) interpretation of the Pali Canon is given in a series of commentaries covering nearly the whole Canon, compiled by Buddhaghosa (fl. 4th–5th century CE) and later monks, mainly on the basis of earlier materials now lost. Subcommentaries have been written afterward, commenting further on the Canon and its commentaries. The traditional Theravādin interpretation is summarized in Buddhaghosa's Visuddhimagga. An official view is given by a spokesman for the Buddha Sasana Council of Burma: the Canon contains everything needed to show the path to nirvāna; the commentaries and subcommentaries sometimes include much speculative matter, but are faithful to its teachings and often give very illuminating illustrations. In Sri Lanka and Thailand, "official" Buddhism has in large part adopted the interpretations of Western scholars. Although the Canon has existed in written form for two millennia, its earlier oral nature has not been forgotten in actual Buddhist practice within the tradition: memorization and recitation remain common. Among frequently recited texts are the Paritta. Even lay people usually know at least a few short texts by heart and recite them regularly; this is considered a form of meditation, at least if one understands the meaning. Monks are of course expected to know quite a bit more (see Dhammapada below for an example). A Burmese monk named Vicittasara even learned the entire Canon by heart for the Sixth Council (again according to the usual Theravada numbering). The relation of the scriptures to Buddhism as it actually exists among ordinary monks and lay people is, as with other major religious traditions, problematic: the evidence suggests that only parts of the Canon ever enjoyed wide currency, and that non-canonical works were sometimes very much more widely used; the details varied from place to place. Rupert Gethin suggests that the whole of Buddhist history may be regarded as a working out of the implications of the early scriptures. According to a late part of the Pali Canon, the Buddha taught the three pitakas. It is traditionally believed by Theravadins that most of the Pali Canon originated from the Buddha and his immediate disciples. According to the scriptures, a council was held shortly after the Buddha's passing to collect and preserve his teachings. The Theravada tradition states that it was recited orally from the 5th century BCE to the first century BCE, when it was written down. The memorization was enforced by regular communal recitations. The tradition holds that only a few later additions were made. The Theravādin pitakas were first written down in Sri Lanka in the Alu Viharaya Temple no earlier than 29-17 B.C.E. The geographic setting of identifiable texts within the Canon generally corresponds to locations in the Ganges region of northeastern India, including the kingdoms of Kosala, Kasi, Vajji, and Magadha. While Theravada tradition has generally regarded Pali as being synonymous with the language of the kingdom of Magadhi as spoken by the Buddha, linguists have identified Pali as being more closely related to other prakrit languages of western India, and found substantial incompatibilities with the few preserved examples of Magadhi and other north-eastern prakrit languages. Linguistic research suggests that the teachings of the Buddha may have been recorded in an eastern India language originally, but were transposed into the west Indian precursor of Pali sometime before the Asokan era. Much of the material in the Canon is not specifically Theravādin, but is instead the collection of teachings that this school preserved from the early, non-sectarian body of teachings. According to Peter Harvey, it contains material which is at odds with later Theravādin orthodoxy. He states that "the Theravādins, then, may have added texts to the Canon for some time, but they do not appear to have tampered with what they already had from an earlier period." A variety of factors suggest that the early Sri Lankan Buddhists regarded canonical literature as such and transmitted it conservatively. Theravada tradition generally treats the Canon as a whole as originating with the Buddha and his immediate disciples (with the exception certain, generally Abhidhamma texts, that explicitly refer to events long after his death). Scholars differ in their views regarding the ultimate origin of the Pali Canon, but generally believe that the Canon includes several strata of relatively early and late texts, but with little consensus regarding the relative dating of different sections of the Canon or which texts belong to which era. Prayudh Payutto argues that the Pali Canon represents the teachings of the Buddha essentially unchanged apart from minor modifications. He argues that it also incorporates teachings that precede the Buddha, and that the later teachings were memorized by the Buddha's followers while he was still alive. His thesis is based on study of the processes of the first great council, and the methods for memorization used by the monks, which started during the Buddha's lifetime. It's also based on the capability of a few monks, to this day, to memorize the entire canon. Bhikkhu Sujato and Bhikkhu Brahmali argue that it is likely that much of the Pali Canon dates back to the time period of the Buddha. They base this on many lines of evidence including the technology described in the canon (apart from the obviously later texts), which matches the technology of his day which was in rapid development, that it doesn't include back written prophecies of the great Buddhist ruler King Ashoka (which Mahayana texts often do) suggesting that it predates his time, that in its descriptions of the political geography it presents India at the time of Buddha, which changed soon after his death, that it has no mention of places in South India, which would have been well known to Indians not long after Buddha's death and various other lines of evidence dating the material back to his time. Scholars have both supported and opposed the various existing views. Other scholars are more cautious, and attribute part of the Pali canon to the Buddha's early followers. Peter Harvey also states that "much" of the Pali Canon must derive from the Buddha's teaching, but also states that "parts of the Pali Canon clearly originated after the time of the Buddha. "[c] A.K. Warder has stated that there is no evidence to suggest that the shared teaching of the early schools was formulated by anyone else than the Buddha and his immediate followers. [d] J.W. de Jong has said it would be "hypocritical" to assert that we can say nothing about the teachings of earliest Buddhism, arguing that "the basic ideas of Buddhism found in the canonical writings could very well have been proclaimed by him [the Buddha], transmitted and developed by his disciples and, finally, codified in fixed formulas." Alex Wynne has said that some texts in the Pali Canon may go back to the very beginning of Buddhism, which perhaps include the substance of the Buddha's teaching, and in some cases, maybe even his words.[e]. He suggests that the canon was composed early on soon after Buddha's paranirvana, but after a period of free improvisation, and then the core teachings were preserved nearly verbatim by memory. Hajime Nakamura writes that while nothing can be definitively attributed to Gautama as a historical figure, some sayings or phrases must derive from him. Much of the Pali Canon is found also in the scriptures of other early schools of Buddhism, parts of whose versions are preserved, mainly in Chinese. Many scholars have argued that this shared material can be attributed to the period of Pre-sectarian Buddhism. This is the period before the early schools separated in about the fourth or third century BCE. Some scholars see the Pali Canon as expanding and changing from an unknown nucleus. Arguments given for an agnostic attitude include that the evidence for the Buddha's teachings dates from (long) after his death. Some scholars of later Indian Buddhism and Tibetan Buddhism say that little or nothing goes back to the Buddha. Ronald Davidson has little confidence that much, if any, of surviving Buddhist scripture is actually the word of the historical Buddha. Geoffrey Samuel says the Pali Canon largely derives from the work of Buddhaghosa and his colleagues in the 5th century AD. Gregory Schopen argues that it is not until the 5th to 6th centuries CE that we can know anything definite about the contents of the Canon. This position was criticized by A. Wynne. Western scholarship suggests that the Abhidhamma Pitaka was likely began to be composed around 300 BCE, but may have drawn on an earlier tradition of lists and rubrics known as 'matrika'. Traditional accounts include it among the texts recited at the First Buddhist Council and attribute differences in form and style to its composition by Sariputra. Scholars generally agree that the early books include some later additions. Aspects of these late additions are or may be from a much earlier period. Other aspects of the Pali Canon, such as the information about society and South Asian history, are in doubt because the Pali Canon was extensively redacted in the 5th- or 6th-century CE, nearly a thousand years after the death of the Buddha. Further, this redacted Pali Canon of Sri Lanka itself mentions that the compilation had previously been redacted towards the end of 1st-century BCE. According to the Early Buddhism scholar Lars Fogelin, the Pali Canon of Sri Lanka is a modified Canon and "there is no good reason to assume that Sri Lankan Buddhism resembles Early Buddhism in the mainland, and there are numerous reasons to argue that it does not." The general consensus seems to be that what Asoka calls Munigatha correspond to the Munisutta (Sn 207-21), Moneyasute is probably the second half of the Nalakasutta (Sn 699-723), and Upatisapasine may correspond to the Sariputtasutta (Sn 955-975). The identification of most of the other titles is less certain, but Schmithausen, following Oldenberg before him, identifies what Asoka calls the Laghulovada with part of a prose text in the Majjhima Nikaya, the Ambalatthika-Rahulovada Sutta (M no.61). This seems to be evidence which indicates that some of these texts were already fixed by the time of the reign of Ashoka (304–232 BCE), which means that some of the texts carried by the Buddhist missionaries at this time might also have been fixed. According to the Sri Lankan Mahavamsa, the Pali Canon was written down in the reign of King Vattagāmini (Vaṭṭagāmiṇi) (1st century BCE) in Sri Lanka, at the Fourth Buddhist council. Most scholars hold that little if anything was added to the Canon after this, though Schopen questions this. The climate of Theravāda countries is not conducive to the survival of manuscripts. Apart from brief quotations in inscriptions and a two-page fragment from the eighth or ninth century found in Nepal, the oldest manuscripts known are from late in the fifteenth century, and there is not very much from before the eighteenth. Pali Text Society edition, 1877–1927 (a few volumes subsequently replaced by new editions), 57 volumes including indexes. The Pali scriptures and some Pali commentaries were digitized as an MS-DOS/extended ASCII compatible database through cooperation between the Dhammakaya Foundation and the Pali Text Society in 1996 as PALITEXT version 1.0: CD-ROM Database of the Entire Buddhist Pali Canon ISBN 978-974-8235-87-5. BUDSIR on Internet free with login; and electronic transcript by BUDSIR: Buddhist scriptures information retrieval, CD-ROM and online, both requiring payment. electronic transcript by Vipāssana Research Institute available online in searchable database free of charge, or on CD-ROM (p&p only) from the institute. Another transcript of this edition, produced under the patronage of the Supreme Patriarch of Thailand, World Tipitaka Edition, 2005, 40 volumes, published by the Dhamma Society Fund, claims to include the full extent of changes made at the Sixth Council, and therefore reflect the results of the council more accurately than some existing Sixth Council editions. Available for viewing online (registration required) at Tipiṭaka Quotation WebService. Sinhalese (Buddha Jayanti) edition, 1957–?1993, 58 volumes including parallel Sinhalese translations, searchable, free of charge (not yet fully proofread.) Available at Journal of Buddhist Ethics. Sinhalese (Buddha Jayanti). Image files in Sinhala script. The only accurate version of the Sri Lankan text available, in individual page images. Cannot be searched though. Transcript in BudhgayaNews Pali Canon. In this version it is easy to search for individual words across all 16,000+ pages at once and view the contexts in which they appear. The Complete Collection of Chinese Pattra Scripture as preserved by the Dai people. Pali Canon in English Translation, 1895-, in progress, 43 volumes so far, Pali Text Society, Bristol; for details of these and other translations of individual books see the separate articles. In 1994, the then President of the Pali Text Society stated that most of these translations were unsatisfactory. Another former President said in 2003 that most of the translations were done very badly. The style of many translations from the Canon has been criticized as "Buddhist Hybrid English", a term invented by Paul Griffiths for translations from Sanskrit. He describes it as "deplorable", "comprehensible only to the initiate, written by and for Buddhologists". Selections: see List of Pali Canon anthologies. A translation by Bhikkhu Nanamoli and Bhikkhu Bodhi of the Majjhima Nikaya was published by Wisdom Publications in 1995. Translations by Bhikkhu Bodhi of the Samyutta Nikaya and the Anguttara Nikaya were published by Wisdom Publications in 2003 and 2012, respectively. In 2018, new translations of the entirety of the five Nikayas were made freely available on the website suttacentral by the Australian Bhikkhu Sujato, the translations were also released into the Public Domain. A Japanese translation of the Canon, edited by Takakusu Junjiro, was published in 65 volumes from 1935 to 1941 as The Mahātripiṭaka of the Southern Tradition (南伝大蔵経 Nanden daizōkyō). A Chinese translation of the above-mentioned Japanese translation was undertaken between 1990-1998 and thereafter printed under the patronage of Kaoshiung's Yuan Heng Temple. As noted above, the Canon consists of three pitakas. Details are given below. For more complete information, see standard references on Pali literature. Samyutta Nikaya (saṃyutta-) Thousands of short discourses in fifty-odd groups by subject, person etc. Bhikkhu Bodhi, in his translation, says this nikaya has the most detailed explanations of doctrine. Khuddaka Nikaya A miscellaneous collection of works in prose or verse. The traditional position is that abhidhamma refers to the absolute teaching, while the suttas are adapted to the hearer. Most scholars describe the abhidhamma as an attempt to systematize the teachings of the suttas: Cousins says that where the suttas think in terms of sequences or processes the abhidhamma thinks in terms of specific events or occasions. Sacrifices have the agnihotra as foremost; of meter the foremost is the Sāvitrī. The other two main Buddhist canons in use in the present day are the Chinese Buddhist Canon and the Tibetan Kangyur. The standard modern edition of the Chinese Buddhist Canon is the Taishō Revised Tripiṭaka, with a hundred major divisions, totaling over 80,000 pages. This includes Vinayas for the Dharmaguptaka, Sarvāstivāda, Mahīśāsaka, and Mahāsaṃghika schools. It also includes the four major Āgamas, which are analogous to the Nikayas of the Pali Canon. Namely, they are the Saṃyukta Āgama, Madhyama Āgama, Dīrgha Āgama, and Ekottara Āgama. Also included are the Dhammapada, the Udāna, the Itivuttaka, and Milindapanha. There are also additional texts, including early histories, that are preserved from the early Buddhist schools but not found in Pali. The canon contains voluminous works of Abhidharma, especially from the Sarvāstivāda school. The Indian works preserved in the Chinese Canon were translated mostly from Buddhist Hybrid Sanskrit, Classical Sanskrit, or from regional Prakrits. The Chinese generally referred to these simply as "Sanskrit" (Ch. 梵語, Fànyǔ). The first woodblock printing of the entire Chinese Buddhist Canon was done during the Song dynasty by imperial order in China in CE 971; the earliest dated printed Buddhist sutra was the Diamond Sutra printed in CE 868 (printed by an upasaka for free distribution);although printing of individual Buddhist sutras and related materials may have started as early as the 7th century CE. The Tibetan Kangyur comprises about a hundred volumes and includes versions of the Vinaya Pitaka, the Dhammapada (under the title Udanavarga) and parts of some other books. Due to the later compilation, it contains comparatively fewer early Buddhist texts than the Pali and Chinese canons. ^ If the language of the Pāli canon is north Indian in origin, and without substantial Sinhalese additions, it is likely that the canon was composed somewhere in north India before its introduction to Sri Lanka. ^ "I am saying that there was a person called the Buddha, that the preachings probably go back to him individually... that we can learn more about what he meant, and that he was saying some very precise things." ^ "While parts of the Pali Canon clearly originated after the time of the Buddha, much must derive from his teaching." ^ Ronald Davidson states, "most scholars agree that there was a rough body of sacred literature (disputed) that a relatively early community (disputed) maintained and transmitted." ^ "as the Buddha taught for 45 years, some signs of development in teachings may only reflect changes during this period." ^ Most notably, a version of the Atanatiya Sutta (from the Digha Nikaya) is included in the tantra (Mikkyo, rgyud) divisions of the Taisho and of the Cone, Derge, Lhasa, Lithang, Narthang and Peking (Qianlong) editions of the Kangyur. ^ Gombrich 2006, p. 3. ^ a b c Harvey 1990, p. 3. ^ Maguire 2001, p. 69–. ^ a b c Wynne 2003. ^ Drewes, David (2015). ""Oral Texts in Indian Mahayana"". "Indo-Iranian Journal". 58: 131. The idea that Buddhist texts were first written down in the first century bce has been widely current since the nineteenth century, but has never been much more than a guess. Its only basis is a short passage, two verses long, found in both the fourth or fifth-century Dīpavaṃsa and later Mahāvaṃsa,that states that the Tipiṭaka and commentaries were first written down at this time...however, it fairly clearly does not even intend to record the first time writing was ever used for Buddhist texts, but the first creation of a complete set of written scriptures in Sri Lanka. ^ a b Robert E. Buswell Jr.; Donald S. Lopez Jr. (2013). The Princeton Dictionary of Buddhism. Princeton University Press. p. 924. ISBN 978-1-4008-4805-8. ^ a b Lars Fogelin (2006). Archaeology of Early Buddhism. AltaMira. p. 13. ISBN 978-0-7591-0750-2. , Quote: "As of the Pali Canon of Sri Lanka, it was extensively redacted in the fifth or sixth century A.D. (Bechert 1978; Collins 1990; Trainor 1997)". ^ Stargardt, Janice. Tracing Thoughts Through Things: The Oldest Pali Texts and the Early Buddhist Archaeology of India and Burma., Royal Netherlands Academy of Arts and Sciences, 2000, page 25. ^ a b c d e Gombrich 2006, p. 4. ^ Gombrich 2006, p. 20. ^ Gombrich 2006, p. 153-4. ^ Morgan 1956, p. 71. ^ McDaniel 2006, p. 302. ^ Mendelson 1975, p. 266. ^ Manné 1990, p. 103f. ^ Gethin 1998, p. 43. ^ Norman 2005, p. 75-76. ^ Schopen, Gregory; Lopez Jr., Donald S. (1997). Bones, Stones, And Buddhist Monks: Collected Papers On The Archaeology, Epigraphy, And Texts Of Monastic Buddhism In India. University of Hawaii Press. p. 27. ISBN 0824817486. ^ a b c Witzel, Michael. “Moving Targets? Texts, Language, Archaeology and History in the Late Vedic and Early Buddhist Periods.” Indo-Iranian Journal, vol. 52, no. 2/3, 2009, pp. 287–310. JSTOR, JSTOR, www.jstor.org/stable/24664702. ^ Von Hinüber, Oskar (1997). A Handbook of Pali Literature (1st Indian ed.). New Delhi: Munishiram Manoharlal Publishers Pvt. Ltd. pp. 4–5. ISBN 81-215-0778-2. ^ Harvey 1995, p. 9. ^ Wynne 2007, p. 4. ^ Payutto, P. A. "The Pali Canon What a Buddhist Must Know" (PDF). ^ Bhikkhu Sujato and Bhikkhu Brahmali. "The Authenticity of the Early Buddhist Texts" (PDF). Journal of the Oxford Centre for Buddhist Studies. ^ a b Gombrich (b). ^ Gombrich 2006, p. 20f. ^ Warder 1999, p. inside flap. ^ De Jong 1993, p. 25. ^ Wynne, Alex. "The Oral Transmission of Early Buddhist Literature - Journal of the International Association of Buddhist Studies (Volume 27. No. 1 2004)". ^ Nakamura 1999, p. 57. ^ a b c Davidson 2003, p. 147. ^ Buswell 2004, p. 10. ^ Samuel 2012, p. 48. ^ Schopen 1997, p. 24. ^ a b Damien Keown (2004). A Dictionary of Buddhism. Oxford University Press. p. 2. ISBN 978-0-19-157917-2. ^ Warder 1963, p. viii. ^ a b Cousins 1984, p. 56. ^ Bechert 1984, p. 78. ^ Gethin 1992, p. 42f. ^ Nakamura 1999, p. 27. ^ Ñāṇamoli 1982, p. xxix. ^ Gethin 1992, p. 48. ^ Lars Fogelin (2006). Archaeology of Early Buddhism. AltaMira. pp. 37–38. ISBN 978-0-7591-0750-2. ^ a b Wynne 2004. ^ Ñāṇamoli 1982, p. xxxixf. ^ Gethin 1992, p. 8. ^ von Hinüber 2000, pp. 4–5. ^ a b "Pali Text Society Home Page". Palitext.com. Retrieved 2012-10-14. ^ Grönbold 1984, p. 12 (as noted there and elsewhere, the 1893 Siamese edition was incomplete). ^ Allon 1997, pp. 109–29. ^ Warder 1963, pp. 382. ^ "BUDSIR for Thai Translation". Budsir.org. Retrieved 2012-10-14. ^ "BUDSIR for Thai Translation". Budsir.mahidol.ac.th. Archived from the original on 2012-07-12. Retrieved 2012-10-15. ^ "The Pali Tipitaka". Tipitaka.org. Retrieved 2012-10-14. ^ "Vipassana Research Institute". Vri.dhamma.org. 2009-02-08. Retrieved 2012-10-14. ^ "Society worldtipitaka". Dhammasociety.org. 2007-08-29. Archived from the original on 2007-03-17. Retrieved 2012-10-14. ^ "Sri Lankan Pāḷi Texts". Retrieved 2013-01-15. ^ "Pali Canon Online Database". BodhgayaNews. Retrieved 2012-10-14. ^ "《中国贝叶经全集》新闻发布会暨出版座谈会_华人佛教_凤凰网". Fo.ifeng.com. Retrieved 2012-10-14. ^ Norman 1996, pp. 80. ^ Griffiths 1981, pp. 17-32. ^ von Hinüber 2000, pp. 24-26. ^ a b Harvey, 1990 & appendix. ^ a b Manné 1990, pp. 29-88. ^ a b Harvey 1990, p. 83. ^ Gethin 1998, p. 44. ^ Cousins 1982, p. 7. ^ Shults, Brett (May 2014). "On the Buddha's Use of Some Brahmanical Motifs in Pali Texts". Journal of the Oxford Centre for Buddhist Studies. 6: 119. ^ Skilling 1997, p. 84n, 553ff, 617ff..
Norman, K. R. (2005). Buddhist Forum Volume V: Philological Approach to Buddhism. Routledge. pp. 75–76. ISBN 978-1-135-75154-8. Wynne, Alexander (2004). "The Oral Transmission of the Early Buddhist Literature". Journal of the International Association of Buddhist Studies. 27 (1): 97–128. Hinüber, Oskar von (2000). A Handbook of Pāli Literature. Berlin: Walter de Gruyter. ISBN 3-11-016738-7. Russell Webb (ed. ), Analysis of the Pali Canon, The Wheel Publication No 217, Buddhist Publication Society, Kandy, Sri Lanka, 3rd ed. 2008. Wikimedia Commons has media related to Pali Canon.